The lilacs are in bloom all around Connecticut so I just had to use them for my Flowers on First series. 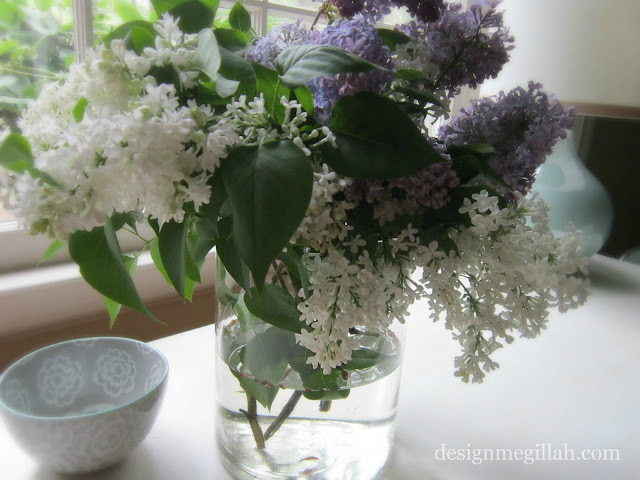 I'm not sure what I love best about Lilacs: the beautiful lavender and white colors or the fragrance. (I wish you could smell these)! Lilacs need full sun for maximum bloom and since our home is mostly shaded (we're surrounded with way too many trees) I can't grow them in our yard--these were cut from a friend's. Lilacs bloom for only a very brief couple weeks in the spring so enjoy them while you can!